Elite Singles is a good dating site for people looking to find as much success in love, as they have in their professional lives. The site offers users a powerful algorithm that matches suitable partners together after a personality test. As such, many have found high compatible matches on the site. Elite Singles also promotes only having matches who are a cut above the rest. Everyone on the site has found professional success. 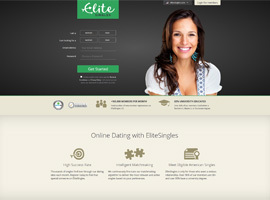 While Elite Singles has been growing in popularity all over the world, the site is most popular in the United Kingdom. Membership has grown exponentially in the United States, Canada, and Australia as of late. You can sign up for Elite Singles for free. You'll be able to register, fill out the questionnaire, and take the online personality evaluation along with your profile. Other members will be able to contact you while you have a free account, but you won't be able to respond. You can see the profiles and upload up to 24 photos of yourself. Like most sites, it's important to note that you must turn off the automatic membership extending option before the time runs out. Or you will be automatically charged for another month. By paying for a premium membership, you’ll access all the features of the site. This includes being able to message and respond to others messages. As well, your profile will be shown to other members at a much higher rate. The main feature of this site is the matchmaking ability. Every single day as a paying member, you will be sent 3-7 matches a day. These matches will be in your area, compatible with your personality and exactly what you described as a desirable mate. The personality test feature on Elite Singles ensures matches are high quality and suited to your tastes. Outside of this fact, the idea that every person on the site is a cut above average ensures great matches. No more broke people without a career to go on a date with. Your data is 100% safe on Elite Singles. The site offers confidentiality and strong encryption policies. The site also offers strong anonymity features against anyone not a member of the site. As one of the premier dating sites for upper-level professional looking for an equal, many have found love, laughter and fun on Elite Singles. If you’re tired of going on dates with broke girls and bum-like guys, this may be the site for you. Sign up today and enjoy browsing the site for free. Then sign up for a premium membership if you’re ready to start meeting some elite-level singles and hopefully, find a great relationship.